This is a long and very strenuous climb following Skeleton Gorge up Table Mountain that will take you about 5.5 hrs to complete (up and down again). It starts at the Fragrance Garden. The climb up the gorge is very steep with ladders in places, very slippery in winter and dangerous after heavy rain. The path follows Skeleton Stream and at times the path is in the stream, requiring scrambling over rocks and boulders. 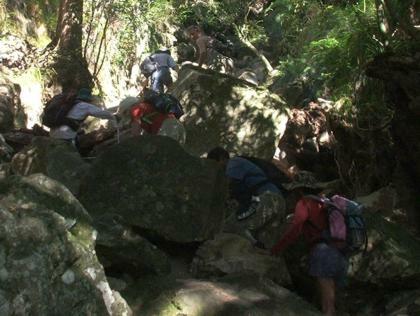 Hikers are strongly advised to purchase a map of Table Mountain for this hike, and to take note of the mountain safety guidelines before setting off. Once on top, hikers can retrace their steps back to where they started, or go south (turn left) go around Castle Rock and come down Nursery Ravine, or go north (turn right) to Maclear’s Beacon, the highest point on Table Mountain (1085.9 m) and retrace your steps back to Kirstenbosch.